Do Above Ground Pools Need Chemicals? Posted on April 4, 2019 April 4, 2019 , in Above Ground Pools. A common question among people who are shopping for their first swimming pool is, “Do above ground pools need chemicals?” The answer is that if you want to keep your water clean and safe for swimming, you’ll need to use chemicals to achieve the proper balance of the various measurements you need to make. You can take these measurements with a pool water test kit. You will have to keep your eye on pH levels, total alkalinity, chlorine and calcium hardness among other things. The results of these tests will predicate which chemicals and what quantities you’ll need to add to the water to get things back in balance. In this article, we’ll go over these tests in more detail. Total alkalinity is the best place to start because changing its levels will affect the levels of all the other tests. Get your total alkalinity balanced first and the other levels will be much easier to adjust. Total alkalinity is the measurement of the water’s buffering capacity. If the total alkalinity is too low or the water doesn’t have enough buffering capacity, metals begin to corrode, and your eyes and skin will be irritated. If the alkalinity is too high or the water has too much buffering capacity, scaling can occur which can plug up your system. You can raise total alkalinity by adding sodium bicarbonate or lower it by adding muriatic or dry acid. 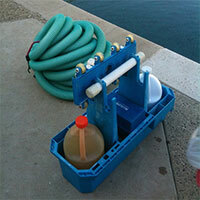 pH levels need to tested regularly and even more often the more the pool gets used. You could quite easily end up having to test your pH on a daily basis. If your pH is too high you could experience scaling. This can be combated with muriatic acid or sodium bisulfate. If the pH is too low your skin will be irritated and corrosion of metal parts will occur. You can combat this by adding soda ash. Chlorine is used in swimming pools as a disinfectant and sanitizer by helping kill germs and bacteria. It also helps destroy organic materials which can make the water cloudy and foul smelling. Chlorine breaks down quickly meaning it has to be added on a continual basis. This is usually done with a pool float that slowly, but continuously releases chlorine. If the tests show, there is too much chlorine in the water you can remedy this by simply removing the chlorine floater until levels taper off. This is a measure of how much calcium is in the water and tells you how hard or soft your water is. Pool water should be slightly hard. Soft water will cause metals to corrode and damage components like tiles and masonry. If the water is too hard it begins to cause scaling. To raise the water’s hardness, you would add calcium chloride. If you need to lower the water’s hardness, you’d typically have to partially empty your pool and refill it with fresh water. To learn more about our above ground pools, download a pool brochure.